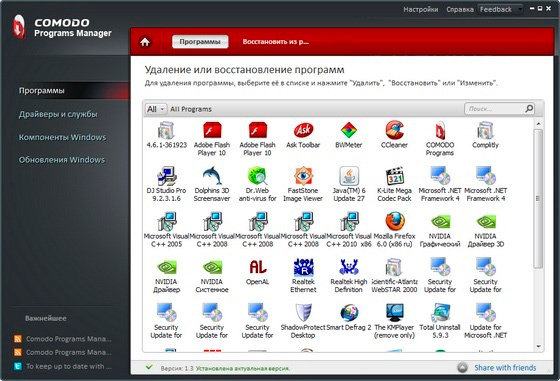 Comodo Programs Manager - новая версия продукта от компании Comodo . Эта полезная утилита для платформы Windows может использоваться для быстрого и аккуратного удаления с жесткого диска установленных программ, драйверов оборудования и компонентов операционной системы. Streamlined user experience - Thanks to the new graphical interface, you are now able to streamline your work and improve your efficiency. Remove locked files - Locked files are automatically removed at next Windows restart. Non-intrusive alerts - Discreet reporting of issues on your computer which can be handled at your convenience. Malware info - To ensure that your computer stays safe, every time a setup is started it is also checked for malware using our cloud technology. Manage windows updates - Choose your own updates to make sure you're using the latest software. Update applications - Using our constantly updated database will keep your computer always up-to-date.